Like every other iOS developer, I have already downloaded and installed XCode 6 and the first beta 8.0 of iOS onto one of my test iDevices. And, like every other IOS developer, I immediately went to go and test one of my apps on the new build. And, unfortunately, as can be expected with a beta, I found a bug. I have dutifully filed a bug report via Apple’s bugreport.apple.com! Given that bug reports are private, I have opted to make information public here because I have had many, many of my product users ask me about it: the bug first arose with iOS 7.1 and I had hoped that it had been addressed in 8.0. Most of my users are not technical enough to be able to navigate the bugreport.apple.com interface, so their only recourse is to complain to us! We have developed a number of custom font profiles for various languages, following the documentation on creating font profiles for iOS 7+ at https://developer.apple.com/library/ios/featuredarticles/iPhoneConfigurationProfileRef/iPhoneConfigurationProfileRef.pdf. Each of these profiles exhibits the same problem: after the font profile is installed, the specific language text usually displays in all apps, including Notes, Mail and more. However, as soon as the device is restarted, the font fails to display in any apps. In some cases, residual display of the font continues after the restart, but any edit to the text causes the display to revert to .notdef glyphs or similar. 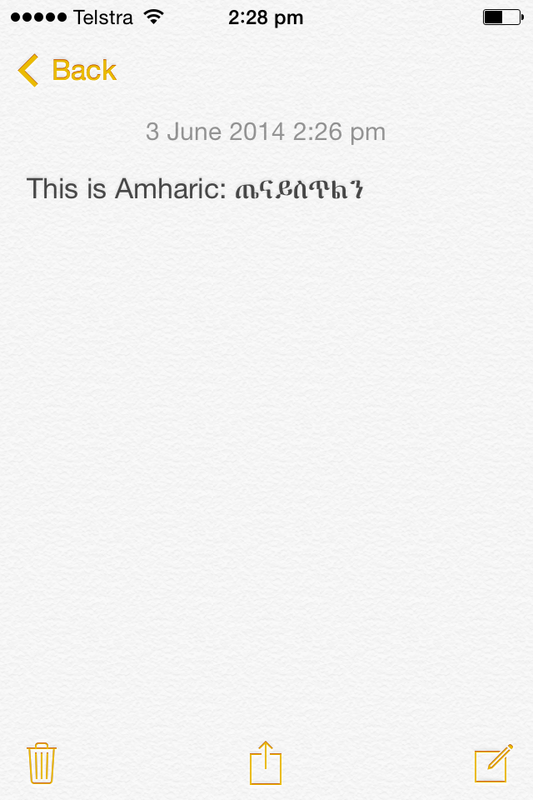 Amharic text after the font profile is installed: now readable. But not for long. Even before the device is restarted, font display is sometimes inconsistent. For example, if you shutdown mail and restart it, fonts will sometimes display correctly and sometimes incorrectly. The samples given are using the language Amharic. The font profile can be installed through my Keyman app, available at http://keyman.com/iphone. A sample of text in Amharic is ጤና ይስጥልን (U+1324 U+1293 U+0020 U+12ED U+1235 U+1325 U+120D U+1295). 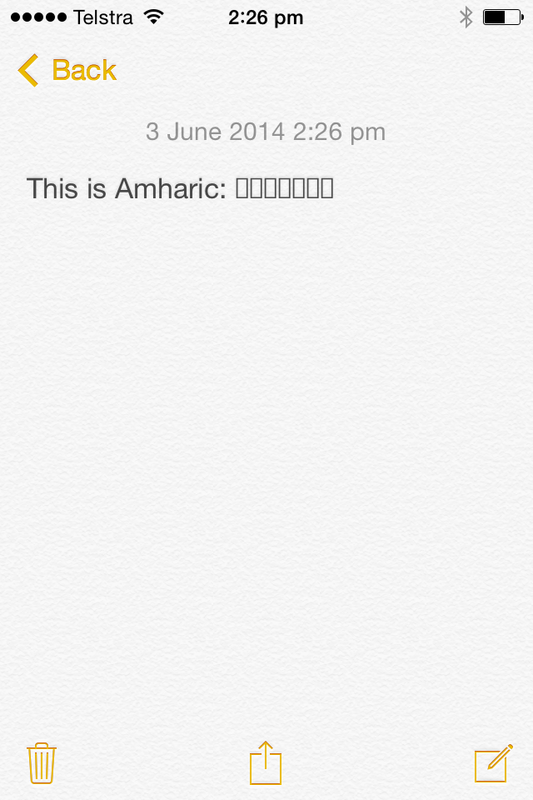 This text displays correctly when the font profile is first installed, in some situations, and always displayed correctly in iOS 7.0. The issue first arose in iOS 7.1 and has continued into the iOS 8.0 beta. In Safari in iOS 8.0 beta 1, I have found that touching fixed elements often results in a touch which is 200-odd pixels north of the actual location I touch. No doubt plenty of people will report this one! I had download of keyman but stil not read amharic geeze if u can fix it please help me? Close all apps: double-click the Home button and then swipe each app that appears up to unload it. Uninstall the font profile: in Settings, General, Profiles, select the appropriate font profile and choose Remove. Restart the device: hold the power button until you are prompted to switch the device off, and then restart it. Reinstall the font profile, through Keyman: you should uninstall your keyboard (swipe it left in the keyboard list) and reinstall it to be prompted to reinstall the font profile.